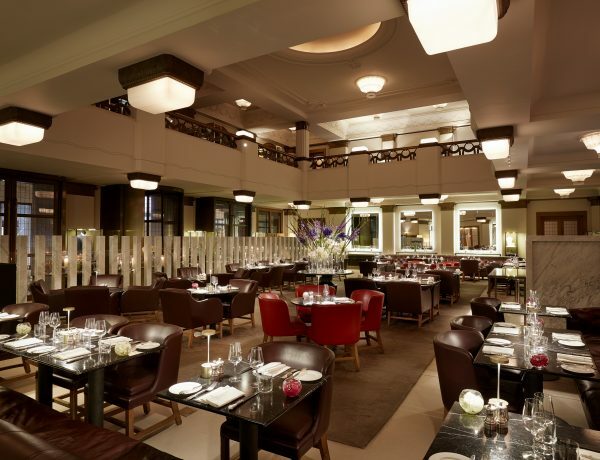 Hotel Café Royal is a five-star hotel located on the Mayfair side of Soho. 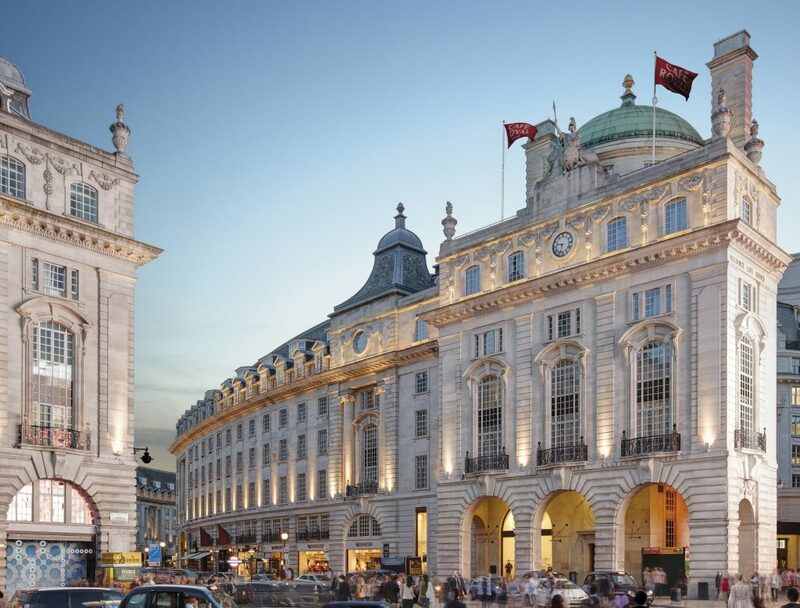 Located within the grandeur of Regent Street, an imposing façade behind which a hotel of refine and sophistication resides. I had my birthday here a few years ago around the time JPR Media Group did their launch, right before the launch of the upstairs private members club. It has remained true to its quality of service, décor, food, spa amenities and warm staff which makes one feel at home. Coming to the hotel as a guest was a totally different experience that I enjoyed immensely. Upon entering Hotel Café Royal, I was greeted by a welcoming doorman. 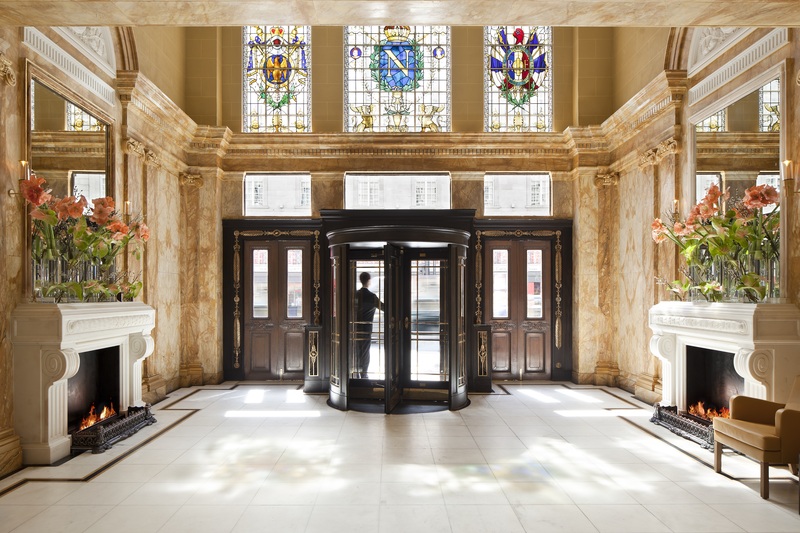 The doormen are more understated than at other grand London hotels, which was refreshing, as sometimes the top hatted greeting feels a bit staged for tourists, especially for a Londoner such as myself. It is situated perfectly, smack dab in the middle of Soho by Piccadilly Circus and Mayfair which is great for the international traveller who might want to visit the new Dover Street Market location in Haymarket, have street food in Soho or go to Mayfair to stroll up Mount Street for Christian Louboutin, Balenciaga, and Marc Jacobs. 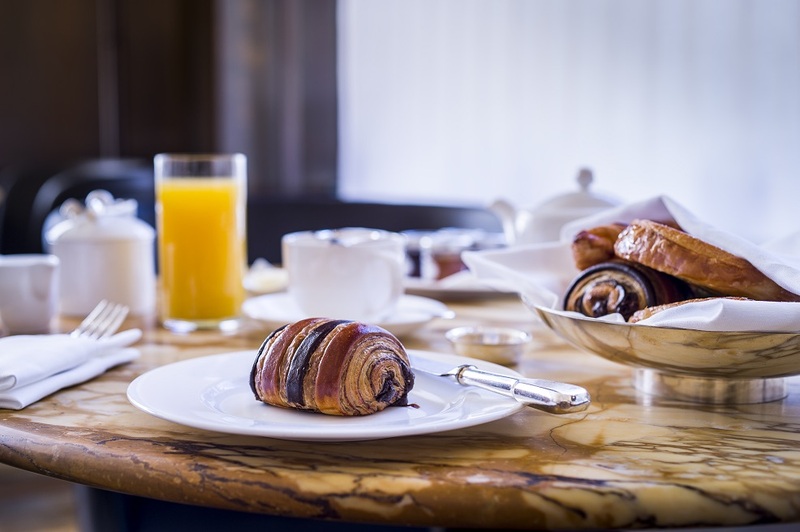 During my stay at Hotel Café Royal I was taken on a tour to fully experience what the hotel has to offer. 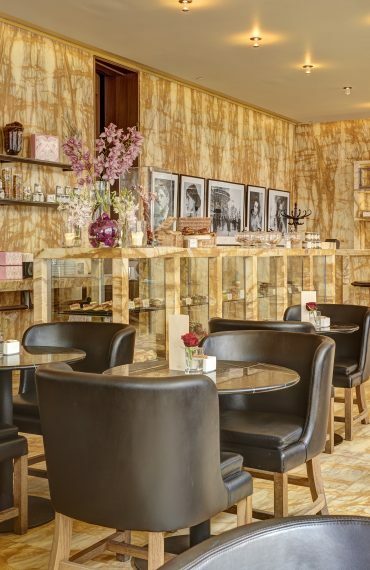 The hotel plays host to a myriad of spaces from a European style café Papillon to The Club at Café Royal which during the Summer is moved from the ground to the first floor (which is the grand Pompadour Room) in order to open the Regents Street facing terrace for guests. I felt the hotel was quite good at seamlessly transitioning between different spaces and each venue has its own unique feel. I decided to leave the hotel and go for a walk and discovered that Papillon and the spa Akasha have separate entrances on the street with their own unique branding. 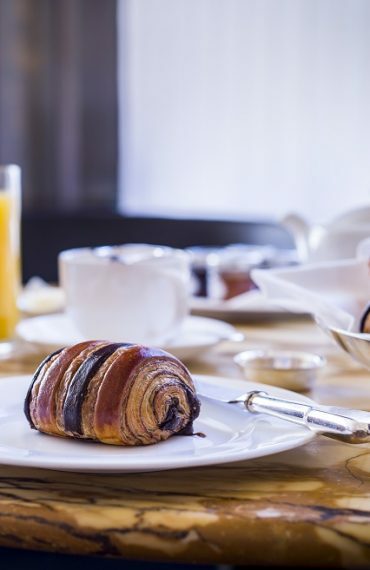 I decided on my first day at Hotel Café Royal to have breakfast at Papillon, breakfast is offered in two locations, The Ten Room which is more of a traditional hotel restaurant and Papillon a modern European style café with flair. 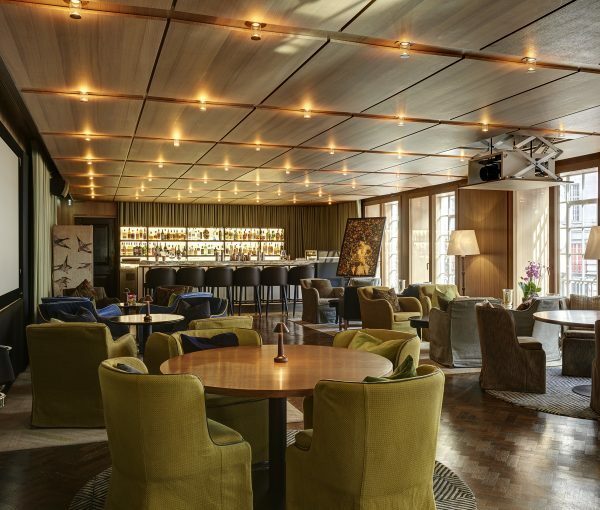 It feels open with a side entrance from Air Street and has an old school feeling as there is seamless piano music playing as a live pianist plays a mix of old and new classics from Adele to Ludovico Einaudi. During my breakfast at Papillon I started with some pistachio pastries, reminiscent of Baklavas, a popular dessert in the Middle East, and also petit pan au chocolat, I also ordered some freshly squeezed grapefruit juice. I then went on to order a full English breakfast of poached eggs of course with sausages, two types of bacon, yummy black pudding and toast with a selection of Hotel Café Royal branded mini jam jars as well as a tiny Tabasco sauce to spice up my eggs. The cafe has huge windows overlooking Regent Street and the golden marble inside made me feel like a princess. The price for the two English breakfasts was £72 in total which is quite punchy for a London breakfast but totally worth it! 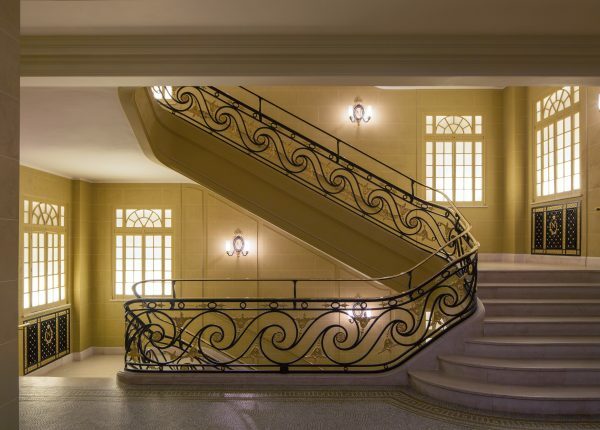 The hotel is themed in an understated marble approach; Papillon departs from this and with large windows a lighter theme. It doesn’t feel like a continental 5-star hotel, you feel transported to a grand palace perhaps situated in an arid desert. 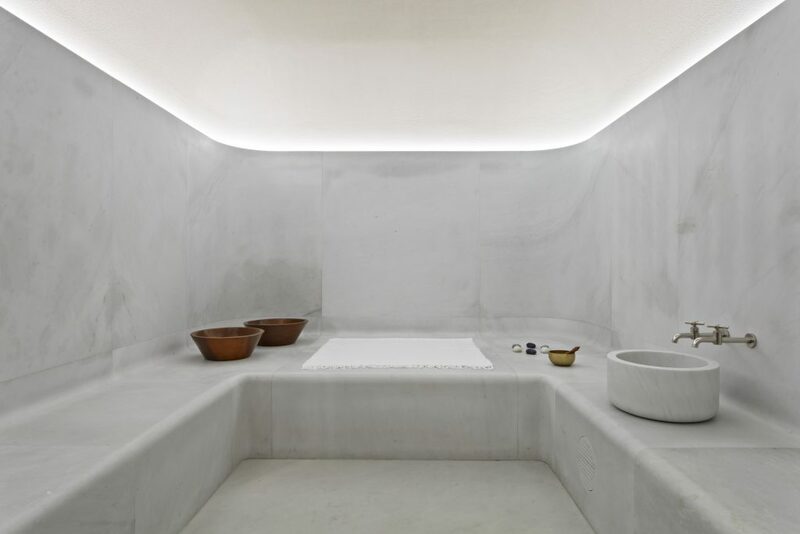 Hence the similar hotel designs at their sister hotel The Conservatorium in Amsterdam. During the day, aside from exploring London I decided to retreat to the spa, imposingly titled the Akasha Holisitic Wellbeing Centre. 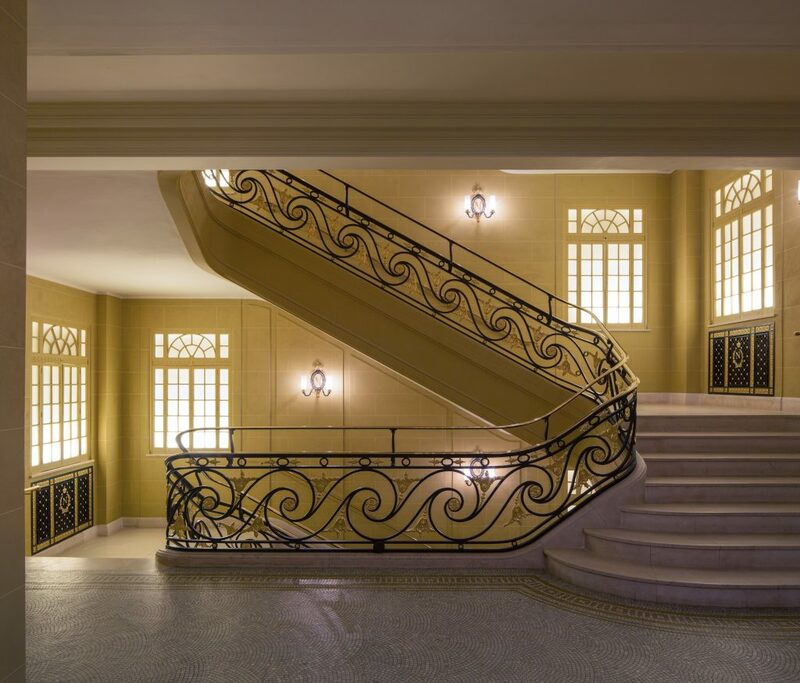 The lift down to the spa has a quirky sliding wood panel outside and maintains the original spiral staircase from the previous building. The spa houses a large pool, sauna, Jacuzzi, private Hamman/Steam room, seven treatment rooms, a gym, a yoga studio and a quiet room. There is a street entrance for members and another in-house entrance for guests. 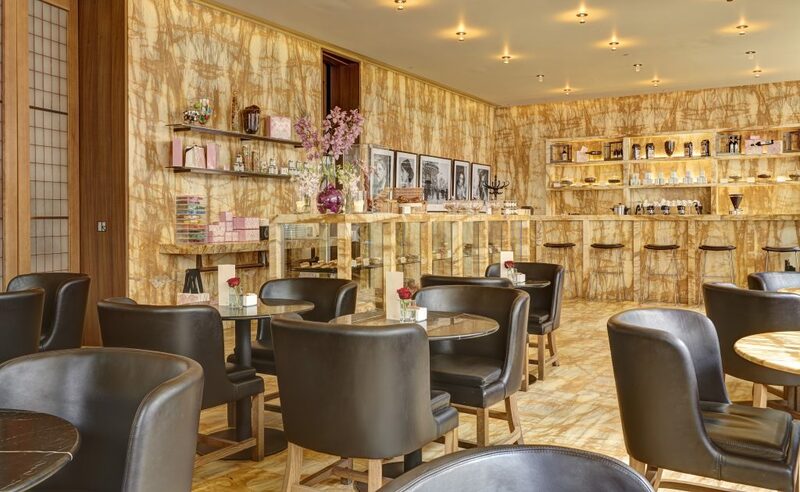 Located in the lower ground floor, the spa is the perfect retreat from the modern world, and although I was only planning on going there for an hour or two I found myself wanting to stay for longer. After enjoying some lengths in the pool, which luckily for me was quiet during the morning, I made my way to the steam room. After leaving the steam room, I went around the corner to a quiet rest room with a selection of nuts and dried apricots as well as a selection of teas that can be taken in front of a fire. The gym is almost the antithesis feeling of the spa. There is heavy bass music and nightclub-like lighting that would motivate anyone to do a high intensity workout. I have worked out here previously and it’s so tucked away that you will most likely be there by yourself or only with a guest or two. If you wish to get an Akasha spa membership that gives you access to the gym, simply call up the hotel and ask for price options. 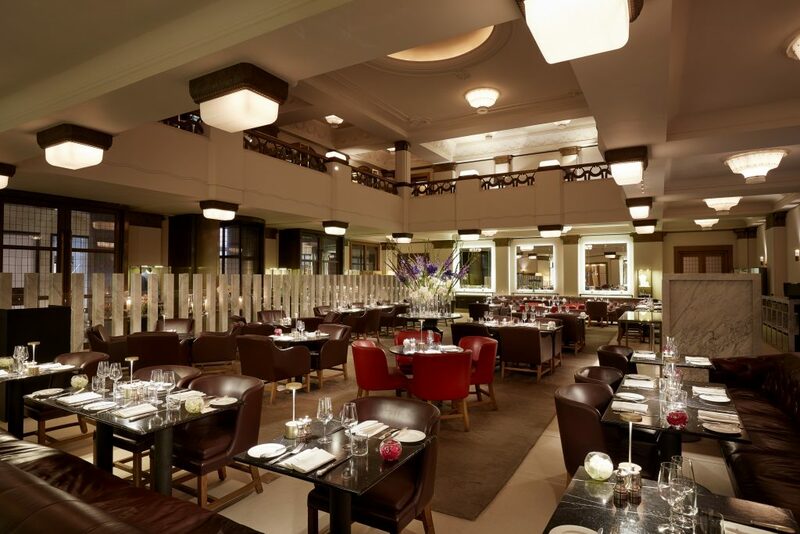 Before I retired for the evening, I decided to visit the Ten Room, Hotel Café Royal’s flagship restaurant. The Ten Room serves a collection of British dishes; I decided to try the Rump Kentish Lamb with a side of terderstem broccoli and garlic. The lamb was deliciously tender and I enjoyed it paired with a bottle of Châteauneuf-du-Pape, Domaine du Vieux Télégraphe, 2012, one of my favourite wines. 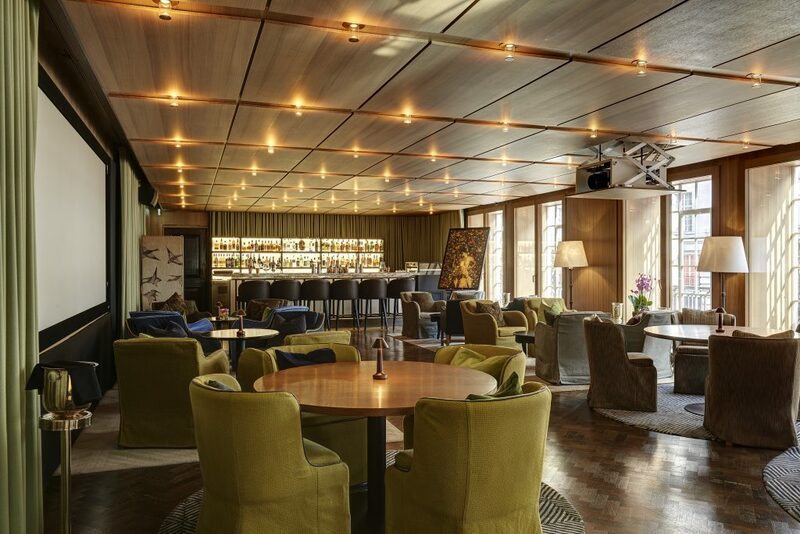 Next to the Ten Room is the Green Bar, which is tucked away and offers a full selection of cocktails. When I went, it was full of smartly dressed men so I am guessing it is a bit of a networking hub for individuals wanting to do business deals. Before retiring for the evening, I decided to have a drink at The Club at Café Royal. I visited during the summer so had the great opportunity to visit the terrace which is home to a pleasant seating area. Impressive arrays of drinks from spirits to fresh juices are on offer, I decided to try the Passion and Bliss mocktail with Passion, fruit, pineapple juice, vanilla syrup and passion fruit puree. After a relaxing evening on the terrace of The Club I retreated to my room. Alas I was not staying at the Dome Penthouse, which offers a fantastic view in London, instead I stayed in one of the hotels suites. The suites are designed to feel like private apartments and I found the décor to be tasteful and understated. The main natural tonal colours of the rooms are beiges, plum, gold and burgundy. It is worth noting though to let the hotel know in advance if one wishes to overlook the Regent Street side of town or not!